Captain Metropolis doesn't even seem to have a role in the movie. He will apparently show up as a member of the Minutemen - we've seen a still photo from the film which confirms that - but there's no actor listed in the role on the Internet Movie Database. Obviously SOMEbody plays the role, but since he's not listed, it probably won't be much of one. Clearly a lesser role than he has in the comic book, because in the comic book, he's one of the most essential supporting characters in the story. He's a pretty big deal, with his pudgy figure and fancy jodhpurs. 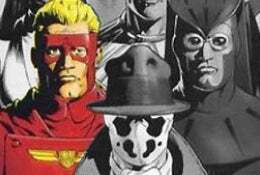 I'll go out on a limb and say that Captain Metropolis is the glue that holds "Watchmen" together.